Would you like a true premium French Press coffee maker unlike the common types everybody else seems to have? Quality you can see and feel, makes you the tastiest coffee or tea and gives a bold look and presence to your table top. Thats the MADRID French press coffee and tea maker by GROSCHE. A uniquely designed and crafted French press with fine chrome construction makes for a wonderful table top coffee and tea making experience. Commonly known as a French Press coffee maker, this style of manual coffee making has been long accepted as perhaps the best way to make full flavored coffee. By allowing the coarse ground coffee (which is the grind you should always use in a French press – finer grinds can seep through the filters) to infuser completely over a few minutes, the flavors and oils extracted in this process are unmatched. It has a dual filter system, with the main press being one, and another one in the lid as well. When You make your coffee or tea, turn the lid to close the press while your coffee or tea steeps, and turn it again to open it to pour. That will retain heat and allow for better flavor for your coffee or tea. 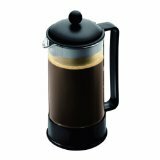 The MADRID French press coffee and tea maker is truly a premium French press unlike any other, for a connoisseur of fine tasting coffees or teas. Replacement beakers are available from the manufacturer as well. The MADRID French press has an ultra premium chrome housing. It is dishwasher safe as well. Since it doesn’t use any electricity, and is easy to rinse and clean, requires no disposable filters, a French press coffee and tea maker like MADRID is also perfect for for taking with you on your travels, or camping as well. For more information and product images and demonstration videos please see the manufacturer’s websites.